Dhaka, 11 Mar, Abnews: Indian Prime Minister Narendra Modi on Sunday said New Delhi is trying to convince West Bengal Chief Minister Mamata Banerjee to start the long awaited Teesta water-sharing deal talk. He said this to Bangladesh President Md Abdul Hamid. He made the remark on Sunday during the International Solar Association Founding Conference in New Delhi. 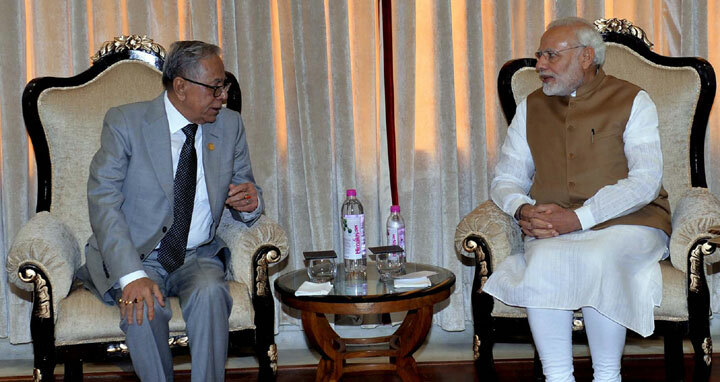 "During the meeting, President Abdul Hamid underscored the importance of the Teesta water availability for the socio-economic development of Bangladesh. In response, Narendra Modi said his government is making all-out efforts to this end and is keen to resolve the issue together with everyone,” President’s Press Secretary Md Joynal Abedin said after the meeting. The Teesta water-sharing deal was about to be signed during the visit of former Indian Prime Minister Manmohan Singh to Dhaka several years back, but it was stopped in the last moment due to Mamata Banerjee’s objection. The water-sharing deal has been held up at the objection of Mamata, who says her state will not have enough water if the deal goes through. Bangladesh has continued to push for the Teesta deal because the water is necessary for irrigation in the northern region during the dry months. President Hamid raised the issue with the Indian PM during the conference on Sunday. The President also sought Indian cooperation for safe, dignified and sustainable return of forcibly displaced Rohingyas to their homeland in Rakhine state of Myanmar. In reply, Modi said the matter has already been discussed with Myanmar, assuring Bangladesh of giving assistance in this regard as it is a big problem for it. During the meeting, Modi also congratulated Abdul Hamid on being elected Bangladesh President for the second term, Joynal Abedin said. He also lauded the communal harmony prevailing in Bangladesh mentioning the festivals of all religions being celebrated at Bangabhaban. Modi also said he is happy and feels honoured for his visit to Assam and Meghalaya as well as for showing respect to the Indians who took part in the 1971 Liberation War of Bangladesh. Abdul Hamid said Bangladesh attaches great importance to the existing excellent relations between the two countries and the relationship is gradually being expanded.